USD$14.00 plus shipping available online from Sierra Hotel Models' website. Each set comprises two parts in grey coloured resin. Simple and effective upgrade for ESCI Vikings and their later re-boxings; excellent casting and detail; easy to fit (but some kit surgery required). One of the main issues with building the available kits of the 1/48 scale S-3 Viking is removing the highly visible join lines inside the two engine nacelle inlets. Sierra Hotel Models has now produced an excellent and accurate way to avoid a difficult task of having to remove the joint line through filling and sanding. 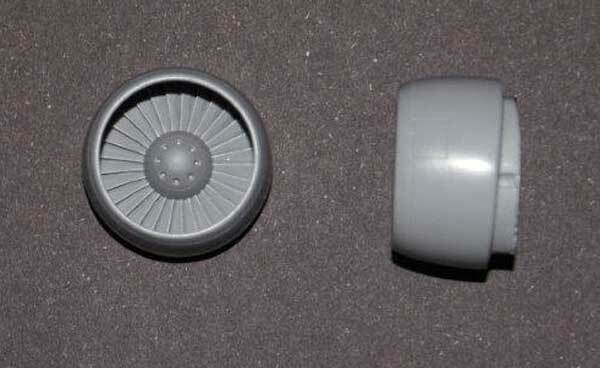 The new engine nacelle fronts come nicely moulded in light grey resin. The guys at Sierra Hotel have captured all of the fine detail of the engine fan blades and hub in these castings. There are no moulding flaws or air bubbles in the resin and the casting block will be fast and easy to remove. The parts have been specifically designed for the Esci kit and all of its subsequent releases by AMT, Italeri and Accurate Miniatures. The engine cowl lips are much finer than those in the kit and the fan blades look much crisper and better defined than the mouldings in my Esci kit. The inlet fan sets come in three configurations – 48403 GE TF-34 early, 48404 GE TF-34 late, 48405 GE TF-34 early and late. It is possible to have one early and one late engine fitted to an S-3. The engine inlets are fairly easy to fit, but require the kit engine inlet to be fully assembled and glued and then accurately cut just forward of the panel line that runs around the nacelle. This is done with a rigid razor saw and then the nacelle is carefully sanded back to the panel line. The instructions also give a good tip on how to eliminate the nasty join line in the engine exhaust and how to install the turbine disc at a later point in the assembly. Thanks to Mike and Curt at Sierra Hotel Models for the review sample.